We have had two weeks of rain, but up until last weekend the temperatures remained warm, so everything is growing very fast. 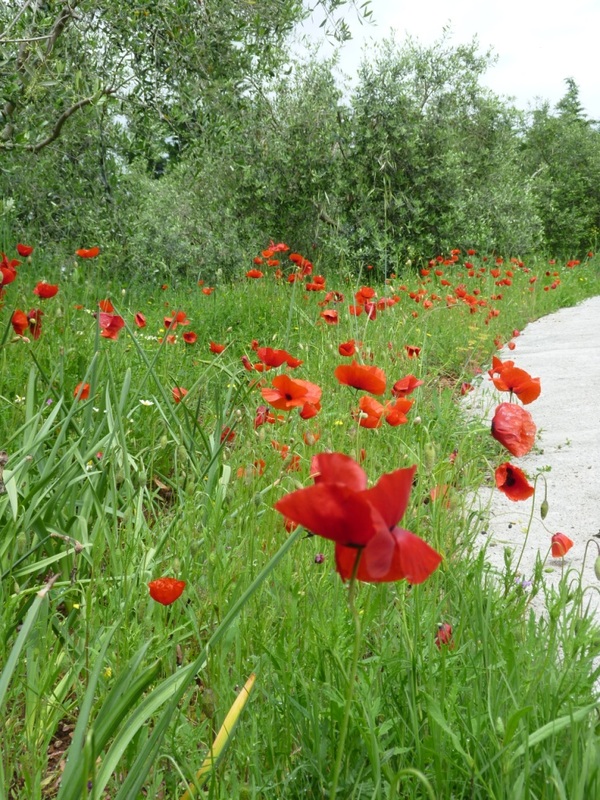 Here are a few general views of the garden including the wild flowers under the olives – I just love poppies; where the soil was dug to plant daffodils, there are now poppies! 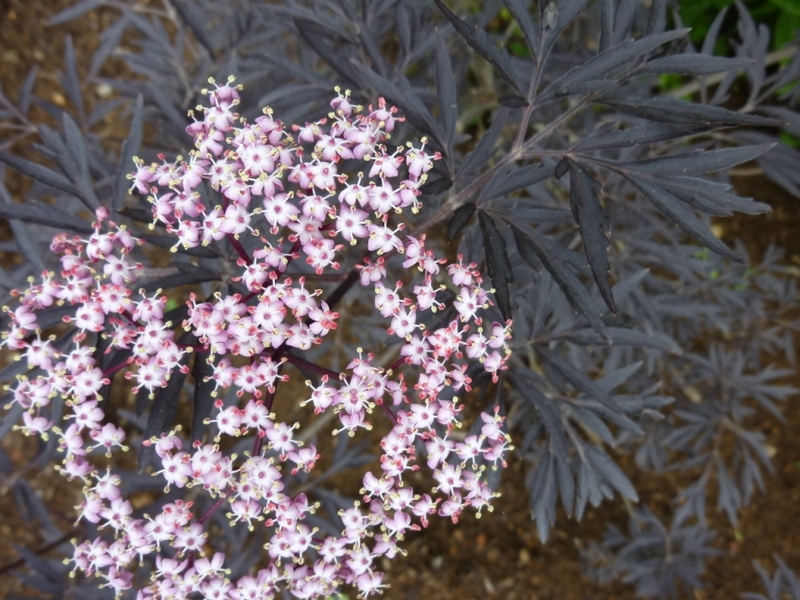 Also flowering is Sambucus dark purple, cut leaved, I think it's called Black Lace. As promised here is the black Iris. The photo was taken on a very sunny day, it looks even darker on a grey day. 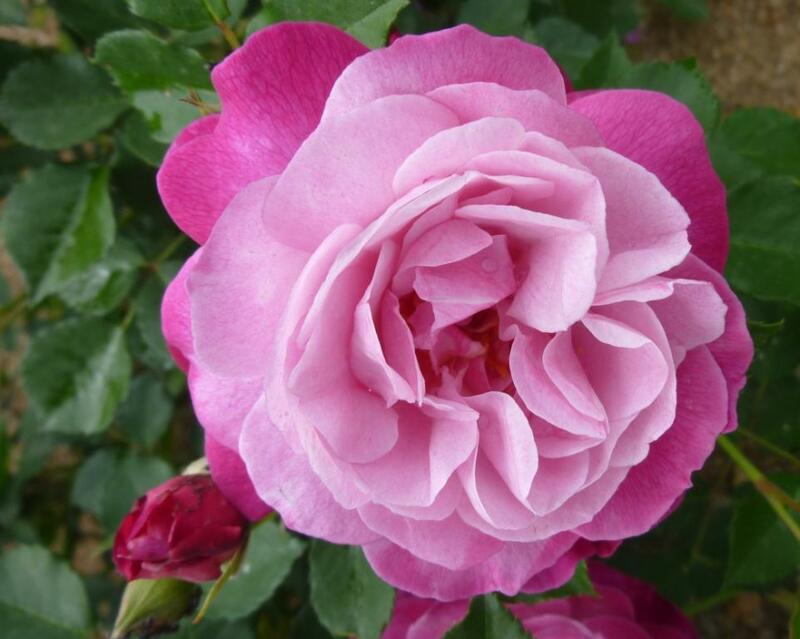 More roses have begun to flower too. The garden is full of delightful perfume and the sound of bees and other insects buzzing. 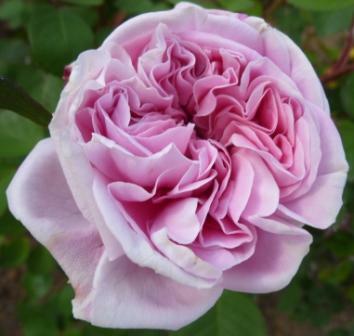 Rosa Queen of Sweden is a very upright rose, holding its flowers up to be enjoyed and smelt. 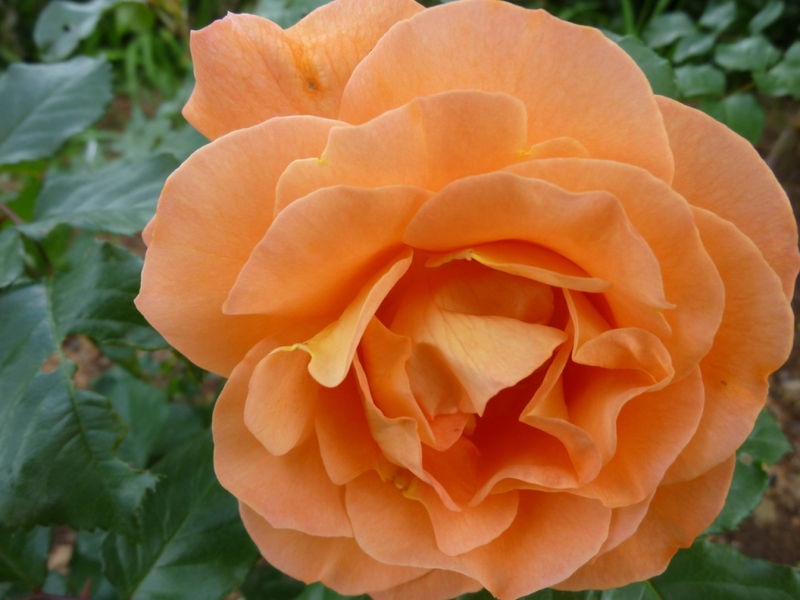 Rosa Westerland is the colour of the sunset! Not an easy colour to place in the garden but it really brightens up a dull corner. 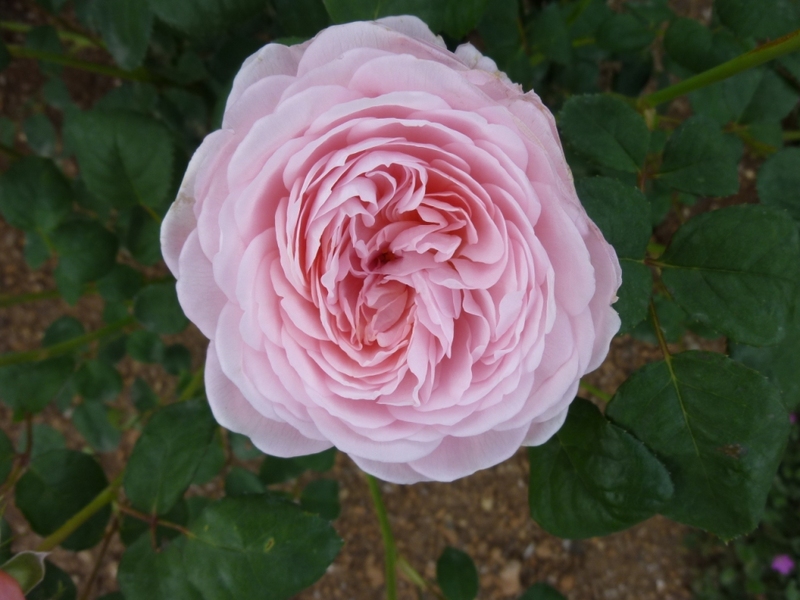 Finally, a rose that I’ve never seen in the UK but here is a real star performer. 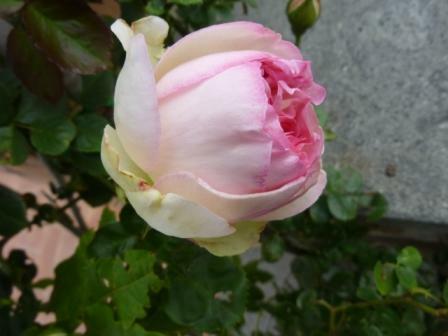 so two pictures – one in bud and the other the open flower. 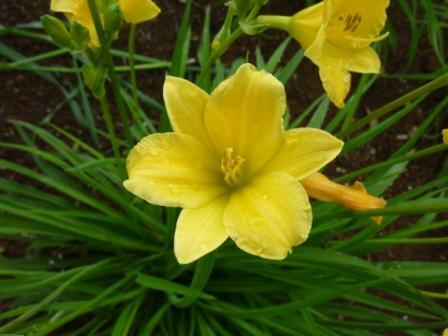 There seems to have been something new blooming almost every day since the last bloom day! 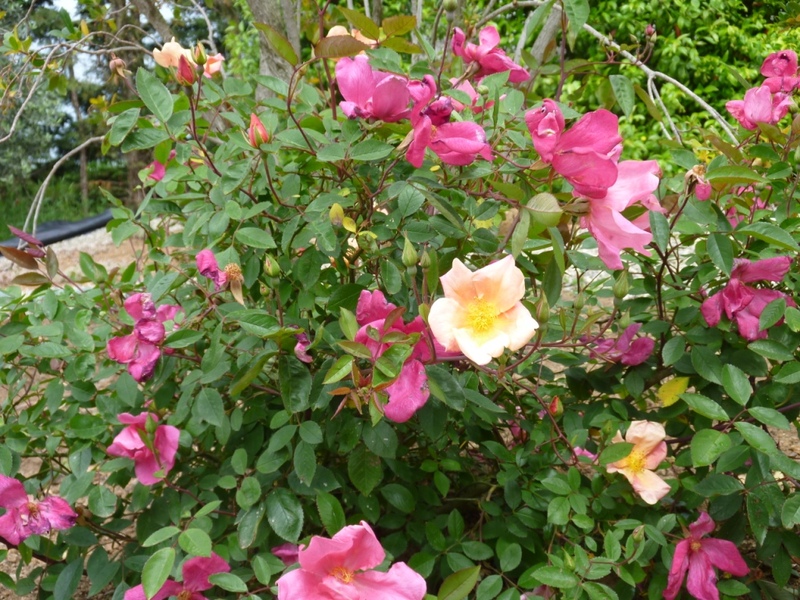 What’s still flowering and therefore very good value: Rosa mutabilis – it had just a few flowers last bloom day now all the bushes are covered in flowers that begin peachy and turn to deep crimson on hot days and to a paler pink on cloudy, cooler days. The Teucrium is still full of flower that attracts many different kinds of bees. Verbena carpets the ground with flowers and smothers weeds. 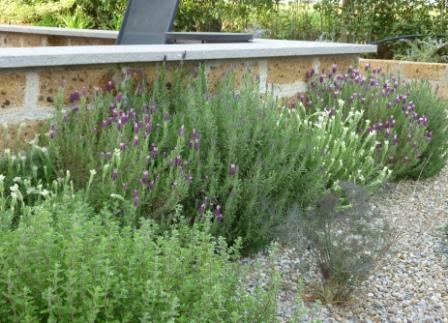 Lavandula steochas in several different colour combinations also attracts bees and fills the air with the perfume of camphor on warm still days. 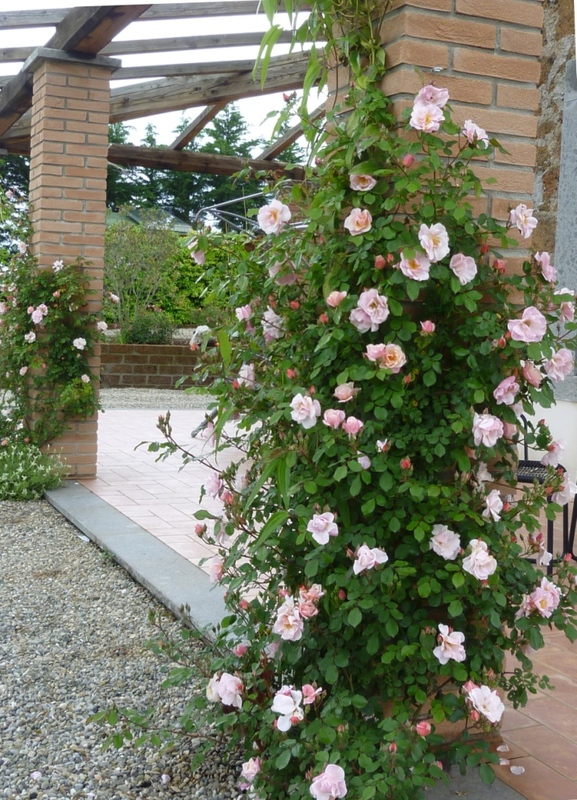 Almost all the roses are now flowering including: R. mutabilis, R. Tradescant, R. Sophie’s perpetual. R. Rhapsody in Blue, R. Gertrude Jekyll, R. Conrad Ferdinand Meyer (began flowering very early), R. Stanwell perpetual (almost as early) R. Molineux, R. Queen of Sweden (opened its first flower actually on bloom day), R. Clair Matin is clothing the pillars on the west side of the house and the climbing yellow rose which I’ve forgotten the name of is looking glorious. 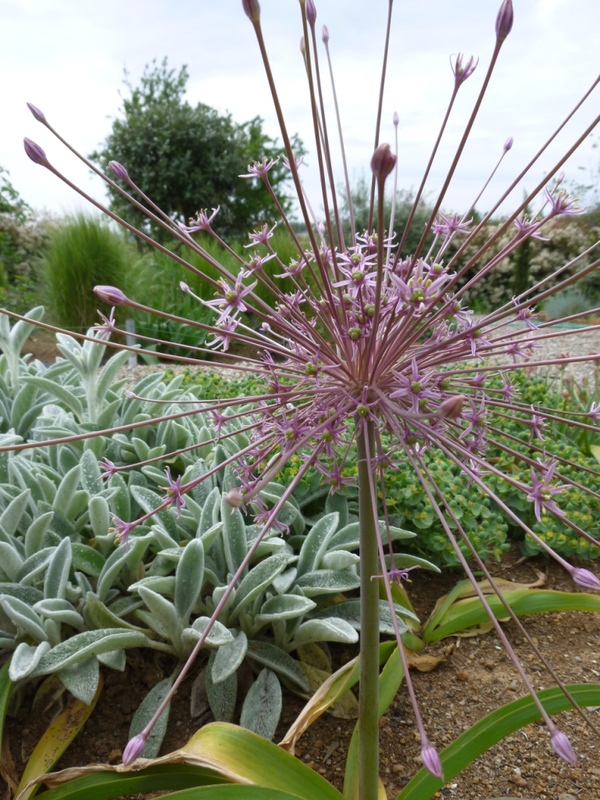 Most of the Alliums have now opened to reveal their amazing forms. Sadly only one A. Schubertii produced a flower – but still worth it. With all these flowers it’s strange but my favourite angle of the garden is under the mulberry tree where the texture of Hosta leaves contrasts with Heuchera and Festuca. Next to this area, but in the sun, the insignificant flowers of Elaeagnus angustifolia ‘Quicksilver’ fill the air with their delicious perfume. I think for my own information I’ll create a spread sheet to show what is in flower when – I think if I allow 4 entries a month I’ll have a very clear picture of which plants are good value flower-wise. 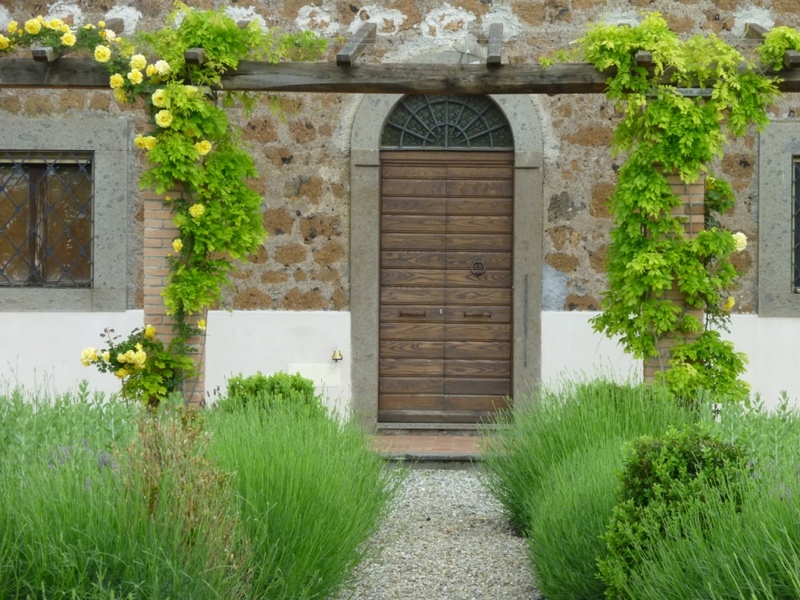 Most plants offer much more than just flowers and so I’ll have to think of a different way of characterizing them. 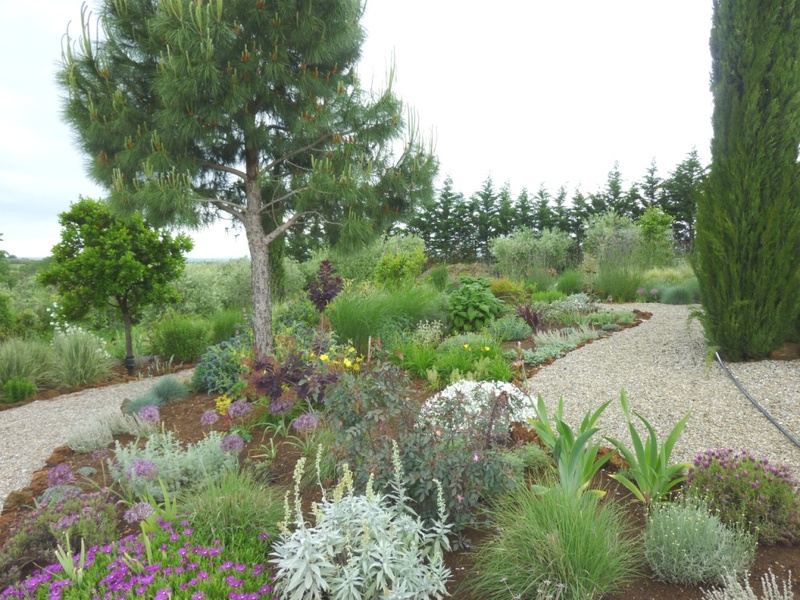 click here to see almost everything else that is flowering. 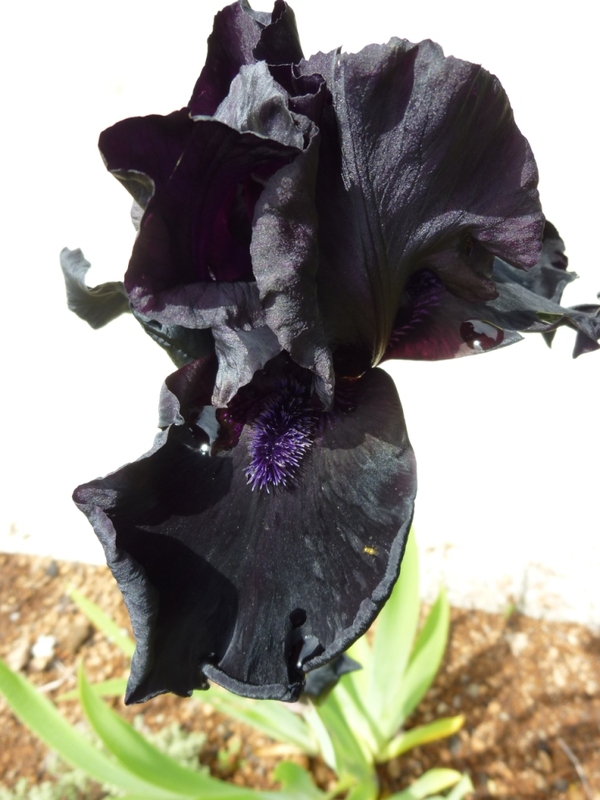 Bloom day was last Sunday and already several other plants have opened their first bud including a truely black Iris – I’ll show you another day. On Sunday afternoon we joined an organised walk to search for wild orchids in the Calanchi. 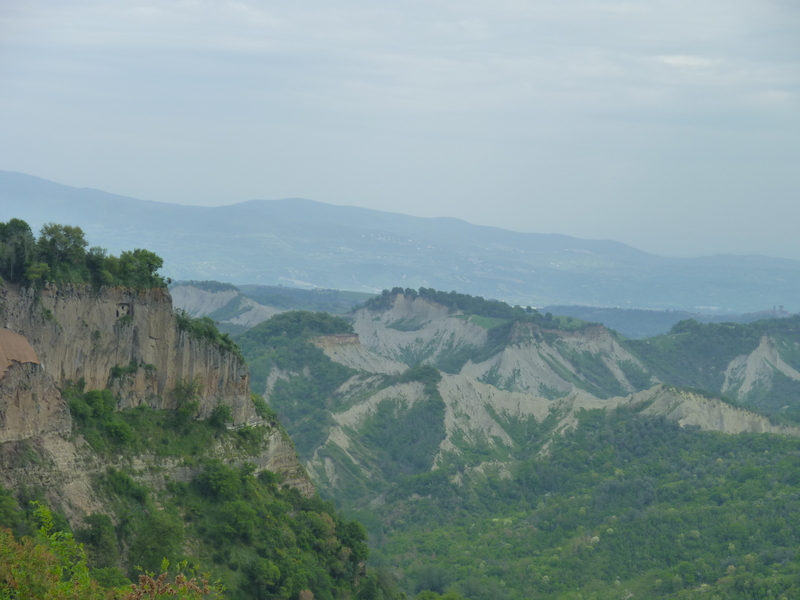 The day was rather grey and dismal but we decided to go anyway and met at the museum in Lubriano. I had no idea how many different species of orchids we would find. We have found small orchids by the roadside in the past, but only one species. Here we found 9 totally different species and not just in ones and two but in large groups or scattered across the fields. We were lucky with the weather too, as it didn’t start raining until we were making our way back to the car. To see all the different orchids please click here. Looking back at the photos I took at Easter at the beginning of the month, it’s very hard to believe that it really is only 4 weeks ago. I was supposed to go to Syria for a holiday for 12 days at the beginning of the month; I am so happy that it was cancelled as I would have missed one of the most beautiful months in my garden. 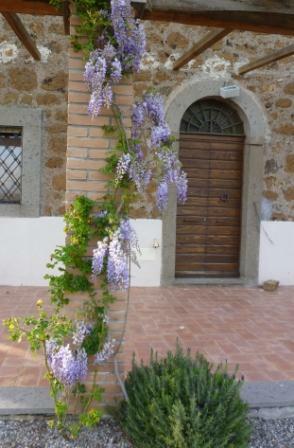 Note for next year – Stay at home during April! Tulips were the stars of the month; fringed Burgundy Lace looked perfect from when they first opened until the middle of last week. I have already been looking at which tulips I’ll plant this autumn and where it will be possible to put them. 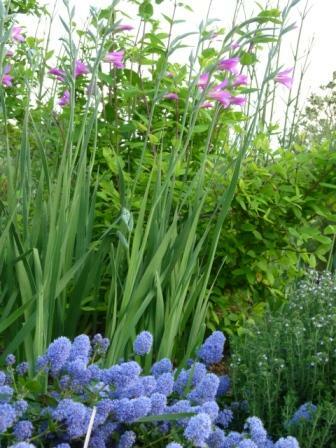 As the white tulips and the alliums in the formal beds at the front of the house flowered for a second year I will plant the other two beds in the same way. 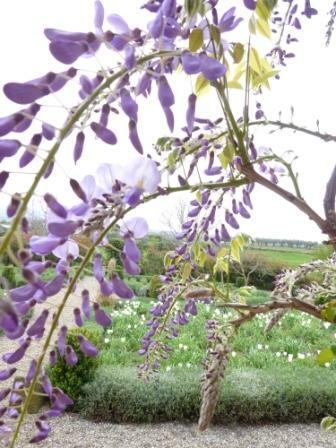 The wisteria on the pillars around the terrace filled the air with their perfume, my peony flowered for the first time, the hedge of Rosa mutabilis which divides the drive from the vegetable garden, which I only planted last autumn are already full of flower and Rosa Conrad F Meyer already had 11 flowers fully open and more fat buds before the end of April thereby proving the RHS rose book accurate in saying that it is a very early rose. Teucrium began flowering in mid-February and is still in full flower, attracting bees and butterflies and creating an airy blue-silver haze of colour. 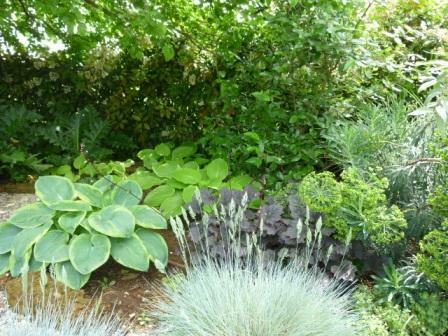 A very subdued planting under the mulberry of various Hosta, Solomon’s seal and Acanthus combined with wine–red Heuchera give a very pleasing restful place to sit and contemplate the garden. Viburnum mariessii directly under the mulberry will flower soon. Jobs that need to be done: I must finish rearranging the irrigation in the back bed. This is, I think, the least successful part of the garden probably because it is shaded by 2 walnut trees and the soil is very thin here; last year the most successful plant was an orange tall Hemerocallis that flowered for ages. Maybe I need some more Hosta under the walnuts in the spaces to cover the ground. My intended colour scheme is based on an Abutilon pictum that has burnt orange flowers that I wanted to combine with purple foliage plants. There are Heuchera and a form of either Lysimachia or Lychnis that has purple leaves and vibrant yellow flowers, (I’m not sure what this plant is because it was a gift from a friend). 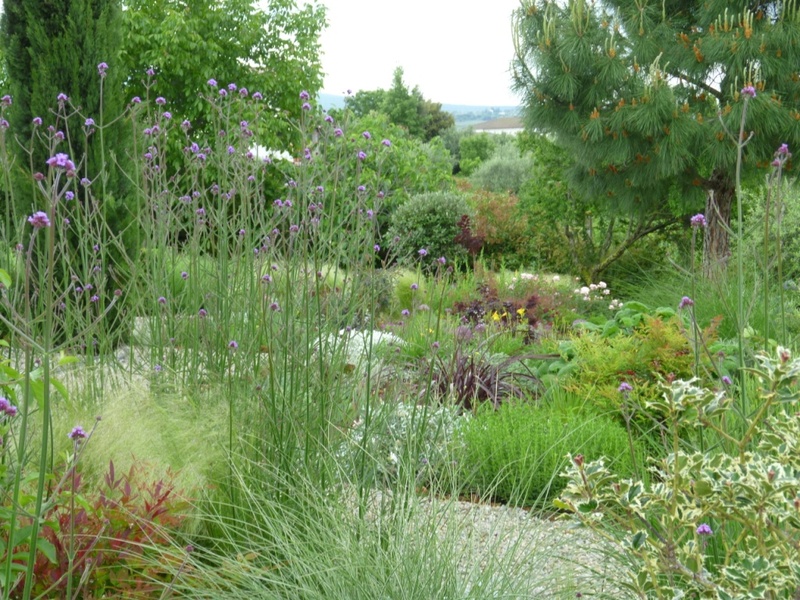 Stipa tenuissa has seeded all over the garden so I want to make good use of it by mass planting a steep bank with it, interspersing it with swathes flowering plants, creating a kind of wild meadow. 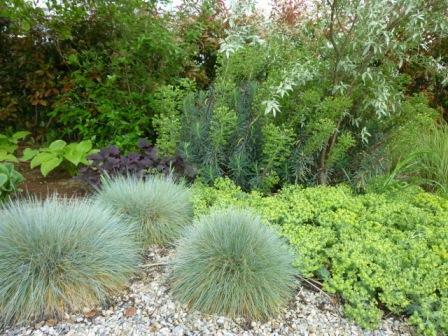 This particular Stipa is such good value being evergreen and fresh looking throughout the winter and moving beautifully in the breeze (read strong wind in this garden). 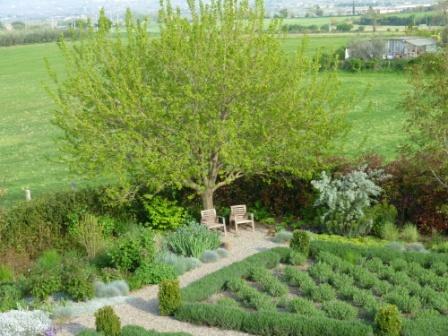 I don’t think I’ve mentioned the French lavender, yet it too has been flowering all month. I read, that in France, they call it English Lavender! 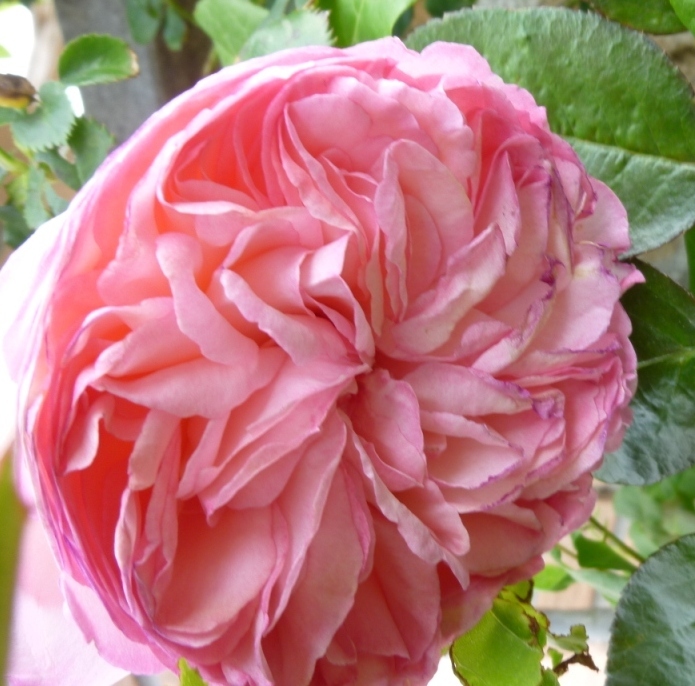 At the end of the month Gladiolus byzantinus , Ceonothus repans, Alliums and Irises are all flowering, and then in May I am looking forward to all the roses, the banksia is already fully in flower. In the vegetable garden, everything is growing well; the sweetcorn seed I sowed last weekend has germinated and will probably need planting out next week.